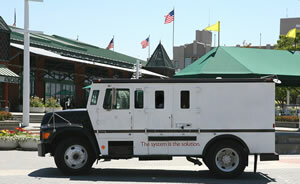 Armored Car Operations need excellent insurance coverage. Do you need a broker who gives prompt answers, better solutions, is willing to invest time and expertise to save you money, and has a genuine commitment to exceptional service? Select AMIS as your broker. We can design an insurance package to fit your Armored Car operation. Our insurance company has over a quarter century of experience in the security industry. We can assess your risk and make sure you receive the most comprehensive coverage possible. We offer coverage for any size account from one-man operations to the largest companies nationwide. Whether your business is new or fully established, we can help you obtain the insurance you need. Our Armored Car Insurance program offers General and Professional Liability coverage with limits from $300,000 to $5,000,000. As the Surplus Line Broker, we can issue quotes in 2 to 3 days from inception. As with all of our programs, we work diligently to continuously improve our Armored Car coverage and keep the premiums competitive with the marketplace. Selling insurance is our business. Our goal is to provide the best coverage at a competitive price. This insurance is underwritten with an A- VIII AM Best insurance company. Containers of Covered Property: Loss of or damage to a locked safe, vault, cash box, etc. caused by an actual or attempted theft. Premises Damage: Damage to the premises or exterior resulting from an actual or attempted theft. $10,000 Pollution Clean Up: If a truck spills gas, oil, etc. as a result of an actual or attempted theft we will pay up to $10,000 to extract the pollutants. 90-Day Discovery Period: We give the customer 90 days after the expiration of the policy period to report a loss. Loss Sustained During Prior Insurance: If the customer sustained a loss under an old policy that would have been covered under the old policy except that the time to collect under the old policy has expired, we will pay for that loss provided it would also be covered under our new policy. 120 Days to File a Proof-of-Loss Form: Most armored car policies only grant 60 days to file a proof of loss. Coverage Extended to Temps: Temporary employees are included in the definition of "employee". No Standard Warranties: Our standard policy form does not include warranties that would void coverage. Claims Handling: Great American Insurance has designated a specialized staff whose sole responsibility is to handle claims for us. Surveys: We perform security surveys on our clients' operations prior to quotation. These surveys are completed by a well-respected loss control firm. Limits: $100,000,000 limits available on Great American paper (higher limits are available on an individual risk basis). The financial condition and claims-paying ability of the Great American Insurance Group were rated "A" (Excellent) as of April 10, 2003 by the A. M. Best Company and "A" (Strong) as of July 21, 2002 by Standard and Poor's. Great American Insurance Companies? Commercial Crime App. 5. Special exposures and policy wording enhancements should be identified. 4. Special exposures and policy wording enhancements should be identified.